Disclosure: I received the Aladdin: Diamond Edition Disney Movies Anywhere (DMA) to facilitate my review. The views expressed in this post are my own. Affiliate links are included in this post. I’m not a good cook…and no I’m not downplaying my skills. My family will wholeheartedly agree that my cooking is questionable. My husband and kids gamely eat the meals I prepare. I stick with tried and true recipes. Rarely venture from my comfort zone. Because I don’t have mad cooking skillz. I cook very simple dishes. You know I am all about Seizing Family Time. In fact tagline of my blog is: Seizing Family Time one dinner…game night…movie at a time. A key part of seizing family time are our Family Movie Nights. We love gathering to watch new and favorite movies. I skip cooking dinner on Family Movie Nights. Instead, I heat up “Movie Snacks”…thin crust pizzas, pizza bagels, egg rolls, pot stickers, mini quiches, and many other finger foods…and we sit and watch the latest movie release. Last weekend’s movie for Family Movie Night was Aladdin: Diamond Edition! 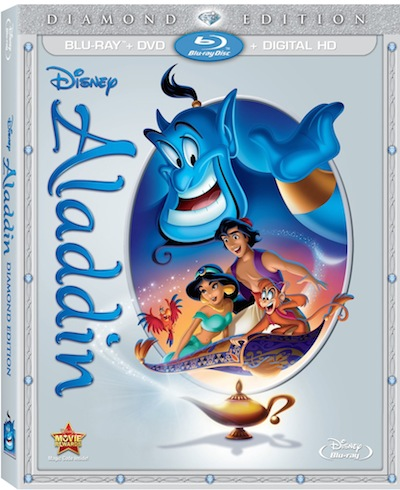 First released in 1992, Aladdin: Diamond Edition is perfect for Family Movie Night. With two parents juggling work and kids’ schedules, seizing family time is difficult. I miss the days when we all ate together as a family every evening, and ate breakfast together too! But with a kid in middle school, a kid in high school, and a kid away at college, our family time takes a back seat to school projects, homework, school events, soccer games, cello practice, swim meets, and church events. Want To Know About the Aladdin Soundtrack? On this clip, Brad Kane discusses his experience recording the memorable songs from Aladdin. A Whole New World won the 1992 Academy Award for Best Original Song. Aladdin: Diamond Edition is now available on Digital HD, Bluray Combo Pack, and Disney Movies Anywhere. Aladdin Diamond Edition is available for the first time in Bluray and Digital HD. Aladdin: Diamond Edition includes never-before-seen tributes to Robin Williams, the “Genius behind the Genie,” Genie 101, and Aladdin: Creating Broadway Magic. Features voice talents of Scot Weinger, Linda Larkin, Gilbert Gottfried, and Robin Williams. Won the 1992 Academy Award for Best Original Song: A Whole New World.